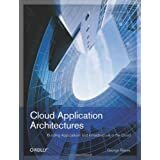 If you’re involved in planning IT infrastructure as a network or system architect, system administrator, or developer, this book will help you adapt your skills to work with these highly scalable, highly redundant infrastructure services. While analysts hotly debate the advantages and risks of cloud computing, IT staff and programmers are left to determine whether and how to put their applications into these virtualized services. Cloud Application Architectures provides answers — and critical guidance — on issues of cost, availability, performance, scaling, privacy, and security.